South-East Asia is one of the most complex regions in the world as far as ethnic, linguistic and cultural diversity is concerned with an extremely rich ancient and contemporary history. Because of this, it offers an exceptionally rich field of study for inter-ethnic relations. This book examines interethnic relationships between groups and the dynamics of exchange networks throughout Asia and includes case studies based in Vietnam, Burma, Laos, Nepal, China, and Siberia. 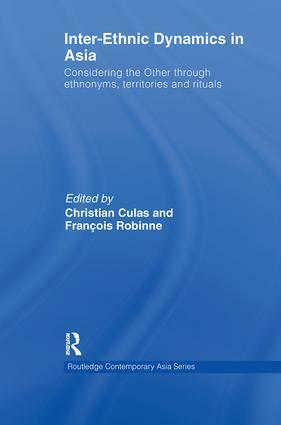 The innovative aspect of this book lies in the fact that the contributors examine relationships between groups and the dynamics of exchange networks across Asia rather than ethnic groups studied in isolation. Rendering the important moments of daily life of ethnic groups and focussing on the exchanges between groups sharing a specific social space, this approach, today still rarely used in Asian anthropology, allows systems of exchange to emerge and for us to understand the systems of power and local leadership from the inside out. Inter-Ethnic Dynamics in Asia will be of interest to students and scholars of Asian culture and society, ethnicity and regional anthropology. Christian Culas is a Senior Research Fellow in Anthropology at the French Institute on Contemporary South-East Asia (IRASEC – CNRS-French Ministry of Foreign Affairs) at Hanoi belonging to the National Center for Scientific Research (CNRS). François Robinne is Director of Research in CNRS (National Centre for Scientific Research) and Director of IRSEA (Institute of Research on South-East Asia) at the Université de Provence, France.